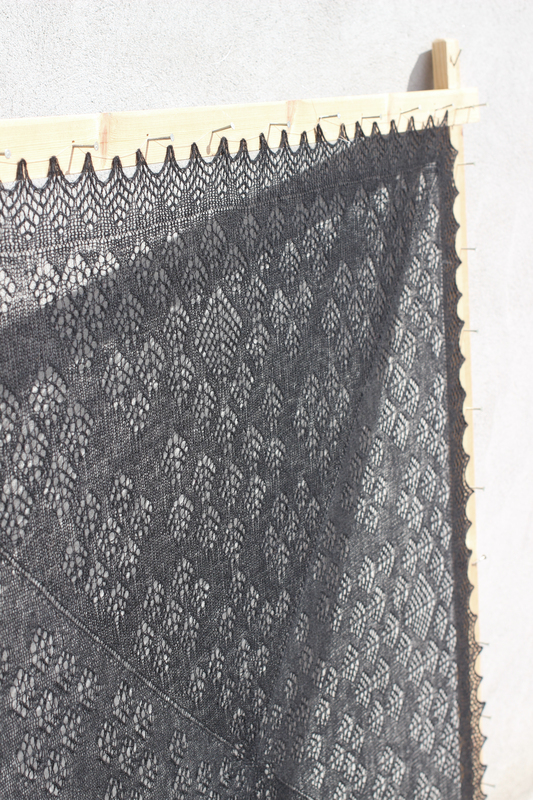 hello everyone, a quick post today about a new version we have of one of our classic patterns, the Brora Black Cobweb Shawl is another one of Gladys Amedro many Shetland 1ply Shawls which Jamieson & Smith released in the late 1980’s and early 1990’s. This pattern was released in 1991 and like all of Gladys patterns was written rather than charted – but recently we had a customer, Heather, who had re charted the pattern for herself and allowed us to use her charts for a charted version of the pattern. For the type of shawls that this one is the tree motif is quite apt as it is often known as the Tree of Life. There are a number of similar motif’s in Heirloom Knitting by Sharon Miller and they are described as such, a 1ply shawl is also used as a christening shawl and they were/are given to a new baby as a present or to be wrapped around them at their Christening. 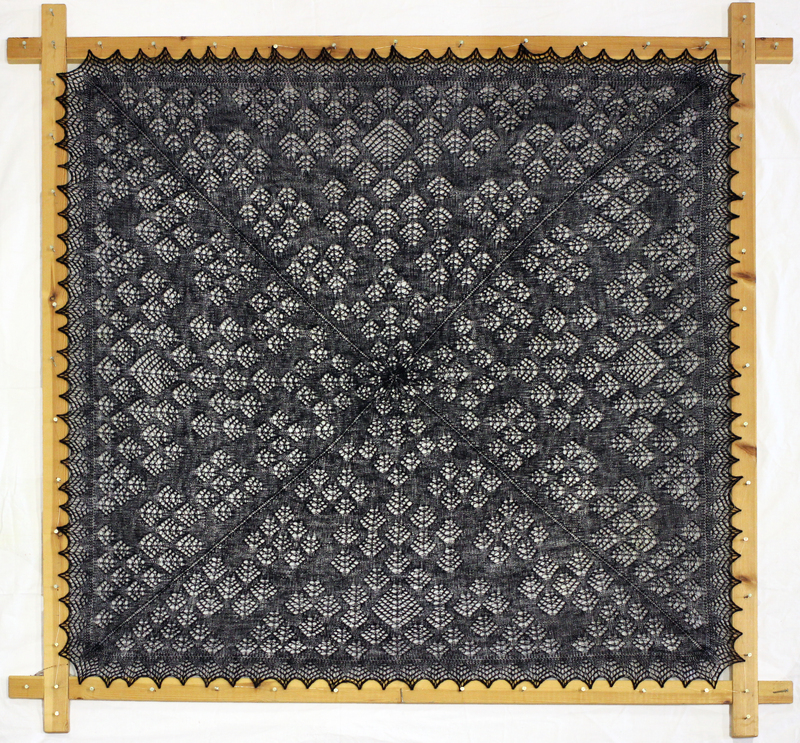 This shawl is quite unusual as it was knit in Black, most are made in white but this was also seen to be able to be used as an evening shawl. Regarding the construction you first knit the border to create the scallops then pick up the stitches and work each triangle 4 times at the same time gradually decreasing as you get towards the centre. This means at the end there is no sewing to be done except your ends! If you would like to knit your own Brora Black we have added the charted pattern kit to the online shop – you can choose to knit it in Cobweb 1 ply available in White and Black or Shetland Supreme 1 ply Available in 5 natural shades and Optic White (Optic is currently out of stock but we are hoping to have it mid August) if you want to know more about the merits of choosing a woollen spun yarn versus a worsted have a look at this post. We are planning to work our way through many of our written patterns and translate them to also be available as a charted one too, so we hope you like it! A few weeks ago I spotted on Ravelry a beautiful version of the Sheelagh Shawl, knit by Anne for her wedding. 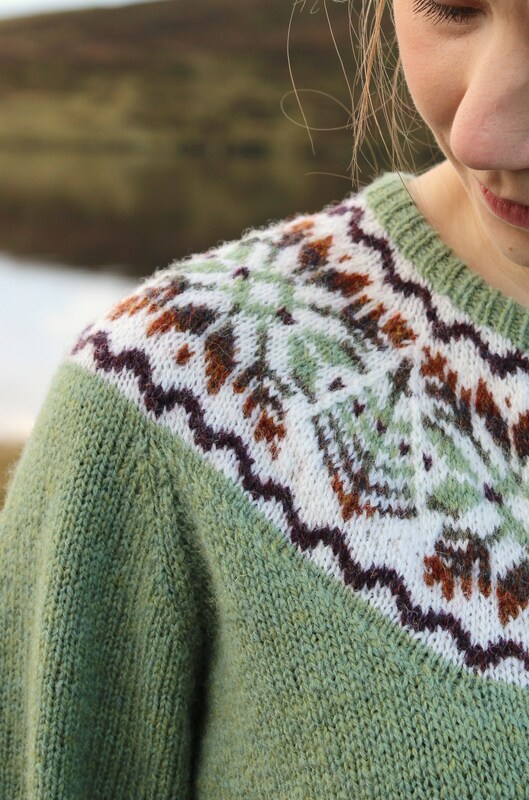 It sparked a memory in me of an email inquiring about receiving the kit in the Shetland Supreme Yarn, we get (of course) lots of emails every day but its always so nice to see a finished item you helped someone get the yarn for. The Sheelagh is a classic Gladys Amedro pattern which begins with the border before picking up stitches (in this case 960 of them!) and knitting it in towards the middle decreasing as you go. ‘I have been a ravelry member since 2011, for the last 2 or 3 years I am online almost every day, browsing patterns, putting them into my favourites, queue, etc. … I don’t remember when, but I came across the Princess shawl from Sharon Miller. I think I discovered the Jamieson & Smith yarns there in the projects (or maybe also through admiring fair isle knitting, which came up around the same time 😉 ). When my now-husband asked if I’d like to be his wife last year in October, I knew I would like to have a shawl to wear on my wedding. In fact I knew this already before and was admiring all the nice lace shawls on ravelry, I started a meant-to-be wedding shawl in a nice off-white Tussah silk from my LYS. I was already done when I realised, this would be way too heavy to wear on a summer wedding. I somehow was afraid of this fact already before, but just did not listen to my inner voice. I still was browsing patterns and yarn shops online almost every day, also the J & S page. I found the Sheelagh shawl kit there and fell in love. It was just the right thing. Not too simple, yet not super complicated (I would also have liked to knit the Princess shawl, but this was out of question at this time point, but I will do it someday…). It was already April and I am a slow knitter. By far I wasn’t sure, if I could ever complete this until end of august. 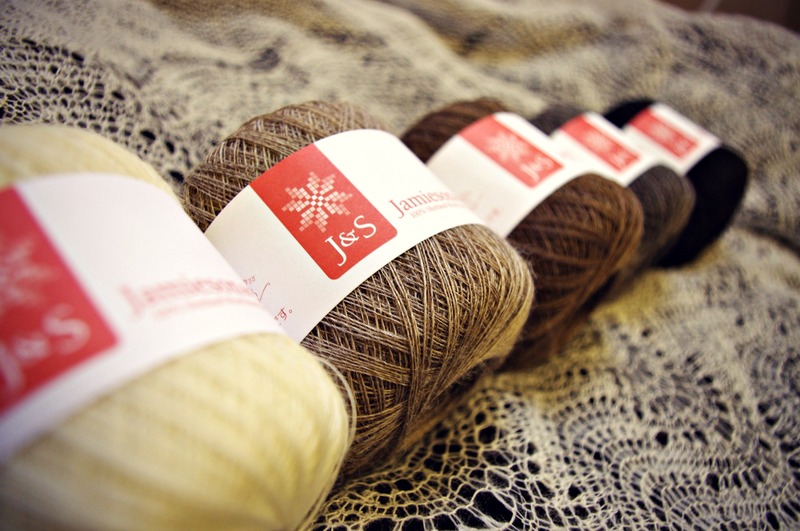 The pattern called for the 1 ply cobweb lace yarn, but there wasn’t an off white available (I already bought my dress which is ivory), so I asked at J&S, if I could also get the kit but replace the yarn with the 1 ply supreme lace. Off course this was possible! The yarn arrived middle of April and I started knitting madly. I literally used every free minute I could get: before I went to work, at work I could only think of when I get home to knit, knitted every weekend. In May I was off sick for a week, I knitted all the day! In the middle of June I finished the last stitch. One day more, it would have been 3 month… In this time I changed my mind constantly from ‘Oh gosh, I will never finish this in time’ to ‘Seems to be manageable, right? !’ and back. But I still could finish the other silk shawl, right? Just parts of the borders were missing. And then not wear it, because it’s just too hot… At least I had a plan B.
I ordered some blocking wires in the US and again was afraid, they would not get here in time. 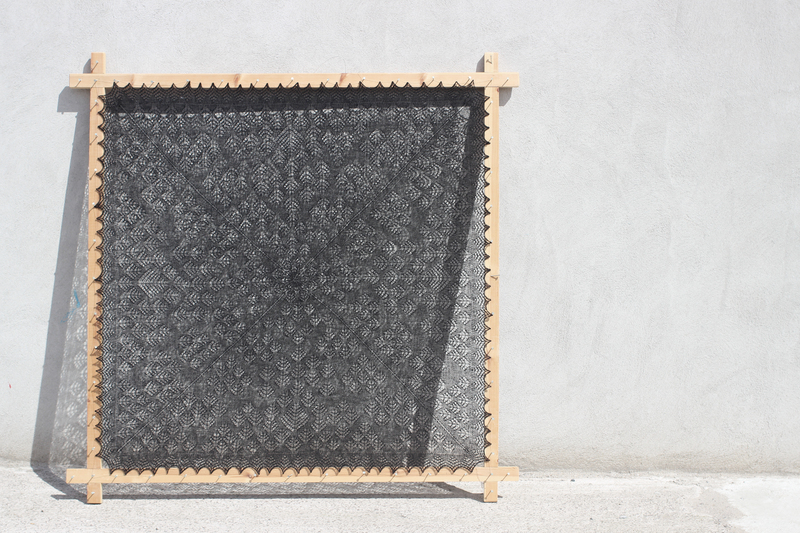 They came, and the shawl blocked from 87 cm to 127 cm each side. I sat next to our guest bed, where it was pinned on, knitting another project and proudly patting the shawl every now and then. I took it to the bridal shop, when I tried my dress to get it fitted and put it on my shoulders there to see if it fits. It was just perfect! Thank you Anne for sharing with us the beautiful pictures of your lovely shawl! You can see more pictures of the knitting process on here ravelry project page here. Many people see these types of Shawls as strictly for a Christening but I think this shows you can make it look very classic yet modern as a Wedding shawl. Seeing this has got me going to sort out the Sheelagh Shawl page on the website and you can now order the kit in cobweb but also in all six of the 1ply Shetland Supreme shades here. Happy Knitting! You may notice when looking at our website we have quite a variety of different yarns in much the same weights but available in Worsted and Woollen spun variations. I thought today we’d go through and look at the differences of both and why you may choose one over the other depending on your project. In relation to the fibre preparation before spinning – Woollen spun fibre is carded and this means the fibres are still overlapping having been carded back and forth over each other, this creates a very airy fibre which when spun is warm and springy. Worsted spun however is combed so all the fibres are lying relatively parallel to each other which creates a smoother and stronger yarn, the combing process also removes many of the shorter fibres, one aspect which can be found itchy by the wearer. The image above also illustrates what it is people sometimes find itchy about wool, those fibres poking out are what irritates the skin and this is why worsted spun can be less itchy than woollen, although worsted spun can still have a visible ‘halo’ the location of the fibres are not actually poking out in the same way as woollen spun. The reason we have similar weights available in both woollen and worsted is because both approach have pro’s and con’s and depending on your intended final finish it is always good to have a choice! In relation to the thinner 1ply yarns Woollen Spun has a crisper feel, whereas the Worsted Spun has more drape and softness. In this photo below you can see the 1ply Supreme (worsted) on the left has more of a halo whereas the 1ply Cobweb (woollen) on the right has better stitch definition – it almost feels like cotton although it is 100% wool. For projects using 1ply you need to think what the finished item will be used for – a baby’s christening shawl which wont be used often may benefit from being knitted in the crisper 1ply Cobweb but a stole that will be worn close to the skin and often may be better in Shetland Supreme. The loftiness in the fibre of Woollen Spun yarn means air is trapped within the yarn making it warm to wear, it also is known all over the world for its use in Fair Isle knitting because of the way the fibres interact with each other. In the below image you can see the effect of the two different spinning processes in Fair Isle, worsted spun on the left and woollen on the right. Both successful and traditional in there own right, its only down to your preference. You can see the Shetland Heritage garment has a sheen and flatness whereas the Supreme Jumper Weight garment has a slightly fuzzy look due to the fibre preparation we mentioned earlier. At the top of this post you can see an image of 2ply Lace and Shetland Supreme 2ply Lace next to each other, the loftiness of the Woollen Spun 2ply is evident to see in the thickness of the yarn and the smoothness of the 2ply Supreme Worsted spun is also clear to see. In finished garments these two aspects can still be seen, In the 2ply Lace the crispness works extremely well in traditional Lace patterns and similarly the drape of the Shetland Supreme 2ply also works well in Shetland Lace patterning. Due to the fibres being combed and all the fibres aligning Worsted Spun yarns are very strong and quite hard to break, Woollen spun has the short and long fibres jumbled together so it is easier to pull apart, this is another thing to think about for your finished garment – Shetland Lace can need quite aggressive blocking so it may be worth looking into the Worsted Spun ranges if this is something that concerns you. I hope this quick look into our worsted and woollen spun yarns has been informative and it might make a bit more sense why we have similar weights in both Woollen and Worsted spun! 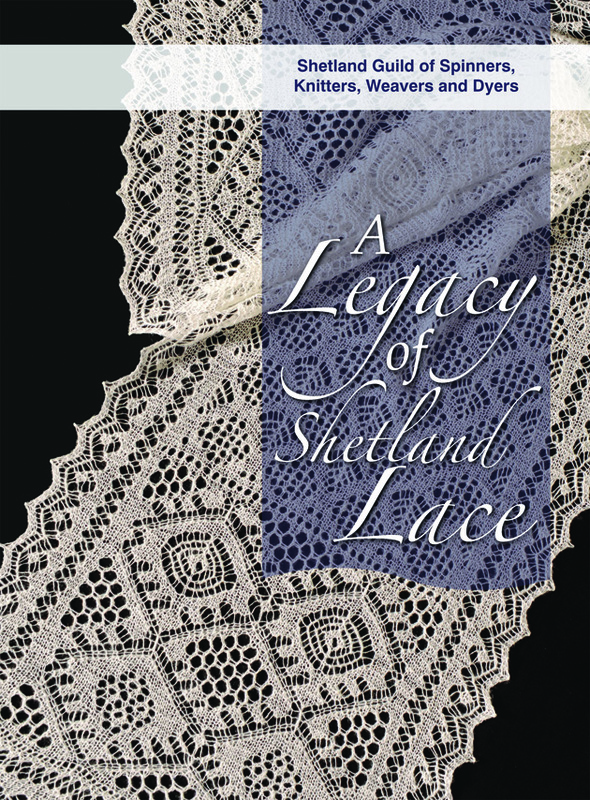 A Legacy of Shetland Lace is a new book released by the Shetland Guild of Spinners, Knitters, Weavers and Dyers. A collection of 21 stunning projects designed by members of the Shetland Guild of Spinners, Knitters, Weavers and Dyers. The book contains everything from scarves and stoles, to wraps and lace tops. As well as the patterns the book has wonderful pictures and explanations of abbreviations, Shetland words to do with knitting, grafting and finishing. 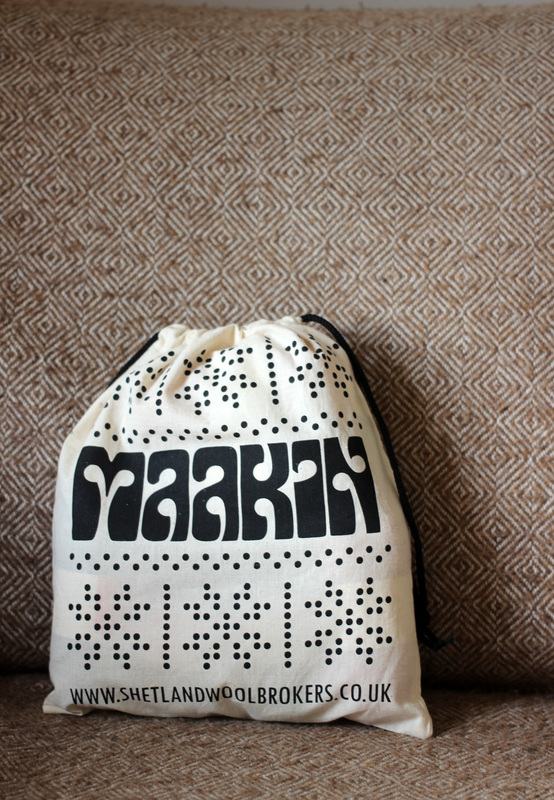 Each pattern is supported by a biography of the designer which charts their story with lace and knitting. 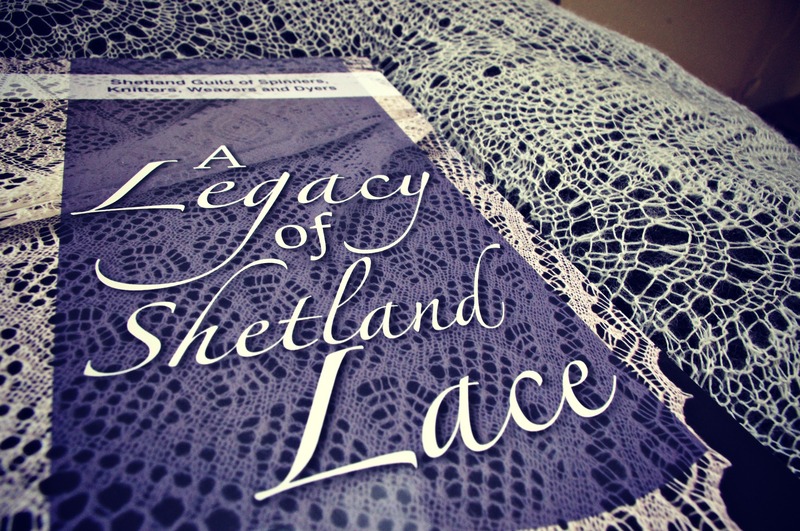 There are patterns in this book from some of the best lace knitters in Shetland. Hazel Tindall, Mary Kay, Ina Irvine and Kathleen Anderson to name but a few.. 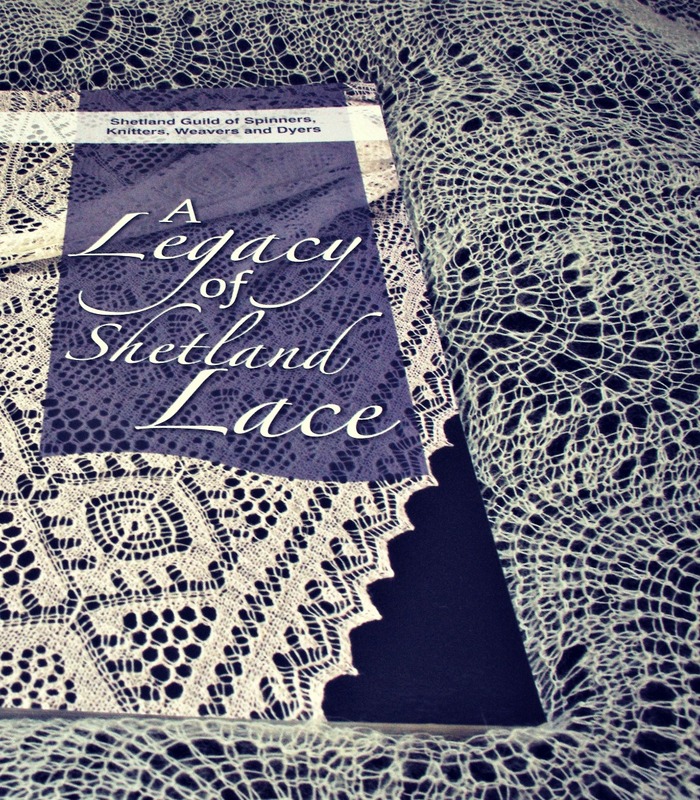 The Legacy of Shetland Lace is a modern and contemporary book that encapsulates our lace knitting history in a group of well designed patterns. 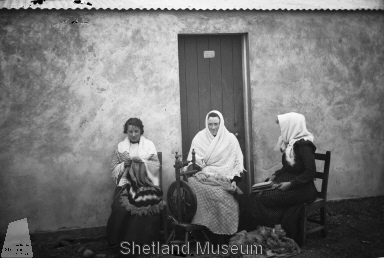 Shetland ladies were (and still are) renowned world- wide for their superb knitting skills and their ability to produce designs from their environment and surroundings. Not only did they carry out most of the croft work they also were accomplished hand spinners and would spin a gossamer fine lace yarn which would be knitted into shawls or scarves. These works of art would be sold to the local merchant or knitwear shop and provide much needed income. All the patterns in the book can be knitted with our Shetland Supreme 1 and 2 ply worsted yarns which come in a range of five natural colours, any patterns calling for 2ply can also use our 2ply Lace Weight Yarn which comes in twenty five shades. There is a lovely pattern by Hazel Tindall which calls for Chunky Shetland wool, in which our Shetland Aran BSS16 would be a perfect match! We at J & S are proud to say that we have reproduced such a fine yarn as used to produce these unique garments all these years ago. In conjunction with our local museum we attempted to revive the art of Lace knitting which was becoming a thing of the past. Part of our inspiration was taken from reading in the local archives that Queen Victoria had stockings made in Shetland from Shetland wool. 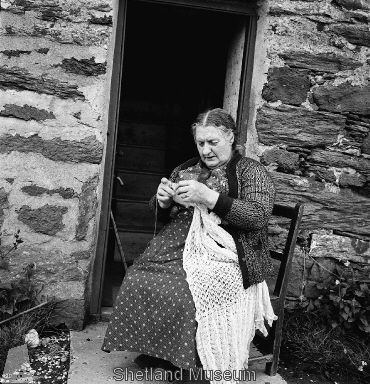 The yarn used was a combed worsted yarn and not a carded woollen spun yarn, the worsted spinning produces a smoother finer stronger thread which captures the unique characteristics of Shetland wool, especially the soft handle required to wear next to the skin. We congratulate the Shetland Guild of Spinners, Knitters,Weavers and Dyers on their superb publication A Legacy of Shetland Lace. Their efforts and skill carries on the distinct culture and heritage of some of the finest knitters in the world. On Tuesday of this week Prince Charles was gifted with a Shetland Rug and a scarf of Shetland Lace, hand-knitted by Mary Kay in Jamieson & Smith 1ply Shetland Supreme. 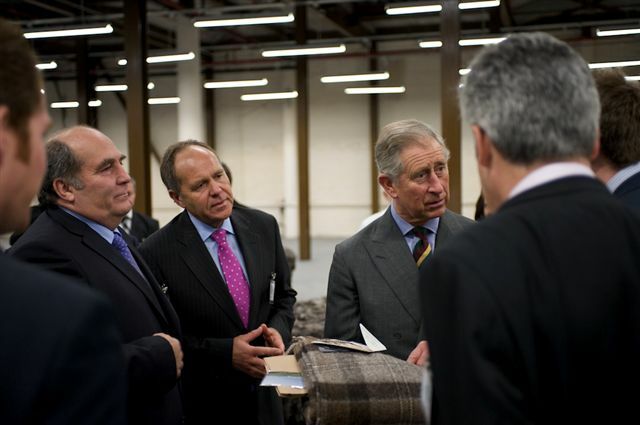 Prince Charles with his undyed Shetland rug. He’ll be cosy this winter! Unless otherwise stated all photos are property and copyright of Jamieson & Smith (Shetland Woolbrokers LTD). Please do not use our photographs without our permission. I can make that, myself...or can I?